This is an external battery pack for the iPhone 4. 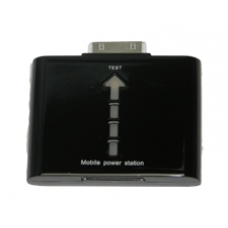 When you are out and about and your phone needs a little more juice, just plug in the Mobile Power Station into the dock at the bottom of your iPhone and the battery pack will transfer the power over. The battery pack can be recharged using the same charger that you use for your iPhone 4. * Rechargeable with an iPhone Charger. * Charge Time: Approx 2.5hours.